The Zung Jung uses a set of 136 tiles. The bonus tiles (Flowers and Seasons) are not used. The 136 tiles are composed of 34 different designs, with 4 tiles for each design. The 34 designs are separated into two groups: the number tiles, and the honor tiles. 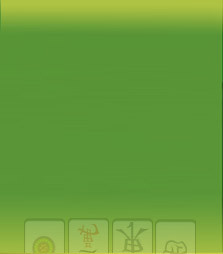 Number tiles: The number tiles are in three suits: Bamboos, Characters and Dots. Each suit has nine designs, numbered 1 to 9. Thus there are a total of 27 different designs of suit tiles, with 4 tiles for each design. Honor tiles: Honor tiles consist of four Winds: "East", "South", "West", and "North", plus three Dragons: "White", "Green", and "Red", for a total of seven different designs, with 4 tiles for each design. Terminal tiles: The "1" and "9" number tiles (total 6 designs) are summarily called terminal tiles, and the "2" to "8" number tiles (total 21 designs) are called middle tiles. In common usage, the term "terminal tiles" is sometimes meant to include the honor tiles, and sometimes not. In these rules, when there is a need for clarity, the terms "terminal number tile" and "terminal and/or honor tile" will be used. The mahjong competition consists of a number of hands. (See the "Tournament Format" chapter for details.) In a hand, through a process of drawing and discarding, the players compete to be the first to complete a winning hand. (Refer to "Drawing and Discarding" and "Winning Hand" below.) The winner of the hand receives points from the other players, but the amount of points earned varies greatly according to the content of the winner's hand. (See the "Scoring System" chapter.) Therefore, winning high-scoring hands (and preventing the opponents from winning high-scoring hands) is the key to victory. A player's result and ranking is determined by his total points won and lost over a number of hands. If someone wins the hand, perform scoring for the winning hand. Sequence: A sequence is three tiles of consecutive numbers in the same suit. Three such tiles in the concealed hand is a "concealed sequence"; an "exposed sequence" is formed by claiming a "chi". Triplet: A triplet is three identical tiles: either three same-numbered tiles in the same suit, or three identical honor tiles. Three such tiles in the concealed hand is a "concealed triplet"; an "exposed triplet" is formed by claiming a "pong". Kong: Four identical tiles can be declared to form a kong. (See the section "Kong" below.) Four identical tiles in the concealed hand are not considered a kong; they constitute only a concealed triplet (plus an extra tile). Pair: Two identical tiles are called a pair.